Deep Space 1, the first spacecraft to use ion propulsion as its main engine, being assembled. 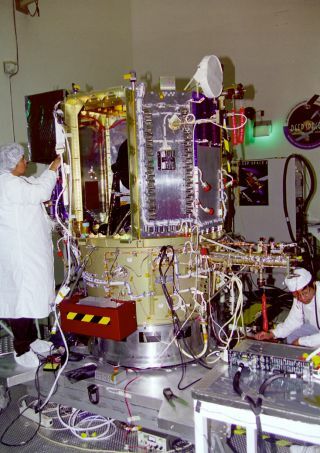 In this historical photo from the U.S. space agency, the Deep Space 1 spacecraft is pictured on Nov. 21, 1997, in the cleanroom. Deep Space 1 was launched in October 1998 as part of NASA's New Millennium Program, which is managed by JPL for NASA's Office of Space Science, Washington, DC. The California Institute of Technology in Pasadena manages JPL for NASA. Deep Space 1 used a unique ion drive propulsion system. Unlike the fireworks of most chemical rockets using solid or liquid fuels, the ion drive emits only an eerie blue glow as ionized (electrically charged) atoms of xenon are pushed out of the engine. Xenon is the same gas found in photo flash tubes and many lighthouse bulbs. The almost imperceptible thrust from the system is equivalent to the pressure exerted by a sheet of paper held in the palm of your hand. The ion engine is very slow to pick up speed, but over the long haul it can deliver 10 times as much thrust per pound of fuel as more traditional rockets. Previous ion propulsion systems, like those found on some communications satellites, were not used as the main engines, but only to keep the satellites on track. Deep Space 1 is the first spacecraft to use this important technology as its primary means of propulsion. The importance of ion propulsion is its great efficiency," says Dr. Marc Rayman, project manager for Deep Space 1. "It uses very little propellant, and that means it weighs less so it can use a less expensive launch vehicle and ultimately go much faster than other spacecraft." "This opens the solar system to many future exciting missions which otherwise would have been unaffordable or even impossible," added Dr. Rayman. The ion particles travel out at about 68,000 miles per hour. However, Deep Space 1 doesn't move that fast in the other direction, because it is much heavier than the ion particles. By the end of the mission, the ion engine will have changed the spacecraft's speed by about 6,800 mph (over 11,000 kph). The technology is so efficient that it only consumes about 3.5 ounces (100 g) of xenon per day, taking about four days to expend just one pound (0.4 kg). The Deep Space 1 ion engine could have a total operating time of more than 583 days (14,000 hours) by the end of its mission in the fall of 2001.